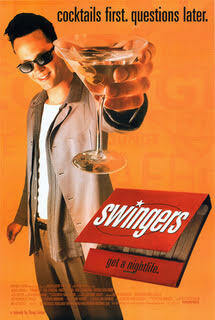 In the third episode of Laugh-In Theater, host Andy Atherton is joined by Todd Weber (Binge, Please) to do a live watch of the 1996 comedy, Swingers. The guys relive their twenties as well as relate to the experiences of Mike, Trent, Sue and Rob; remark about the nineties fashion as well as the resurgence of swing and big band music at the time; the guerilla filmmaking that director Doug Liman had to employ; the fresh-faceness of Vince Vaughn and Jon Favreau; and try their hardest to get through the many cringeworthy scenes. Get on your finest suit and go over and get yourself a beautiful baby because you’re money!